I'm teaching a one night drawing class at the Bodies Exhibition at the South street seaport on November 5th starting at 7pm - 10pm. Should be an awesome time. I'm going to concentrate on individual attention for this class rather than doing a full demo, that way the students will have plenty of time to explore this great exhibit. haha I used to work there! I tried to get a job there just so I could study them. Unfortunately I didn't know much about anatomy at the time. 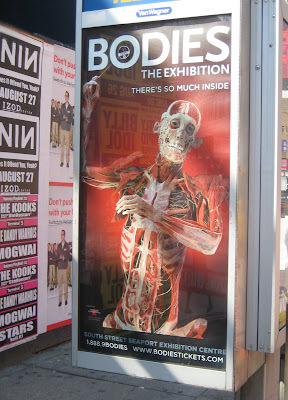 But it helps when reading anatomy books now, since I've seen it before and can visualize it better now. One of these days, when you have time, could you do a little post on your color theory? Ive read some tids bits on you about your palette, but I would love to know more. I would also like to know more about what mediums your using, and how you use them. Hi David, Just checking your blog to see what you have been up to since leaving Portugal. Are you aware that these plasticized corpes are Chinese political prisoners, executed and then sold to these franchises? I've been hoping that someone would challenge this merchandizing of human flesh made plastic. Exploiting human cadavers is illegal, but this plastice process has "put it into a different category". It would be a wonderful scenario, if they had donated their bodies to science, but given the reality of it, it is just macabre.